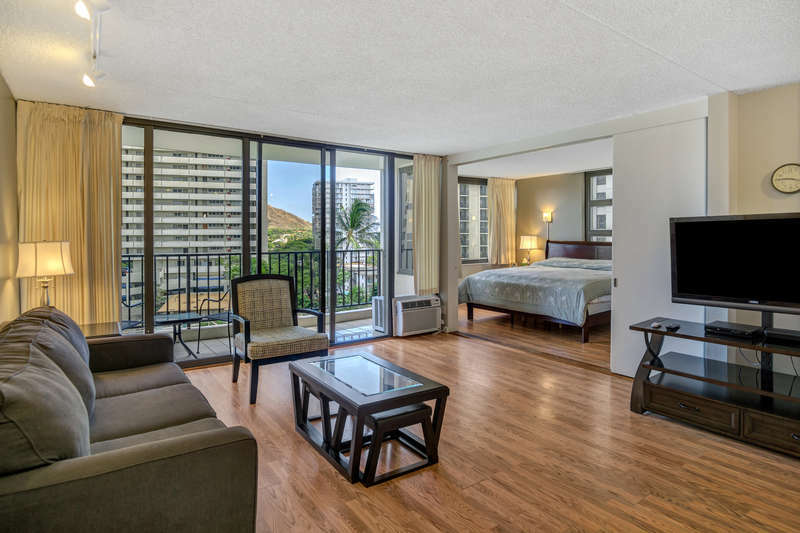 Watch either surfers or golfers from you lanai - both views are great - in this fully equipped ocean view suite. 2710-1 is completely upgraded in the kitchen and bathroom vanity. Tile throughout the kitchen, living room, bathroom, and lanai. Carpet in the bedroom. Island decor. If you are looking for a stylish home away from home – this is the place to be! The kitchen features beautiful cabinetry, stainless steel appliances, along with granite counter tops and backsplash. Enjoy a fully-equipped kitchen which includes refrigerator, range, microwave, rice maker, coffee maker, and other kitchen wares. The kitchen table seats four people. 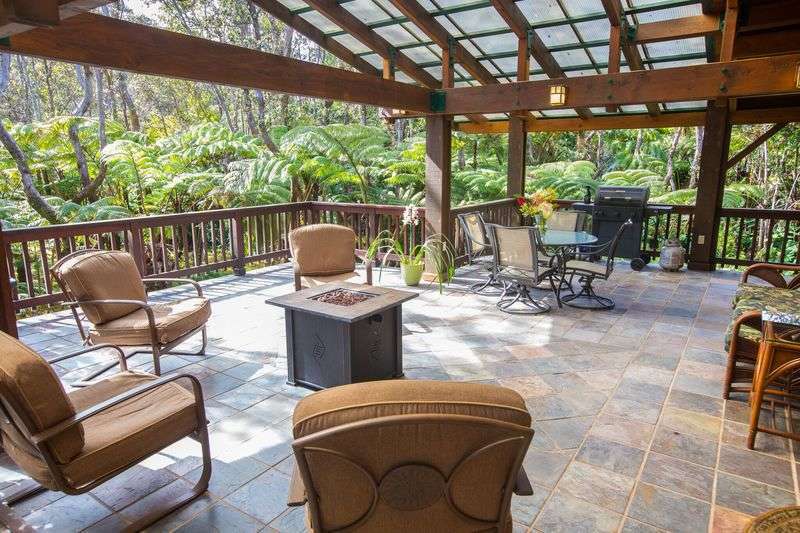 The living areas are tiled. Relax and kick back in the recliner in the living room in front of the wall-mounted flat screen TV. There is also a couch for additional seating. Convenient sleeping options including king bed in the bedroom and a sofa sleeper in the living room. The bedroom has a fan for additional comfort. The bathroom has plenty of storage space. A hand shower was installed for your comfort. Plus, there are two doors to access the bathroom giving more privacy to bedroom occupants. Save money and enjoy the convenience of FREE covered parking, FREE WiFi internet and FREE local and toll free phone calling. Take advantage of all of the extras we provide so you can get the most out of your vacation. Koko Resorts saves you money with standard amenities including FREE parking for one vehicle, FREE WiFi internet, and FREE local and toll free phone calling. 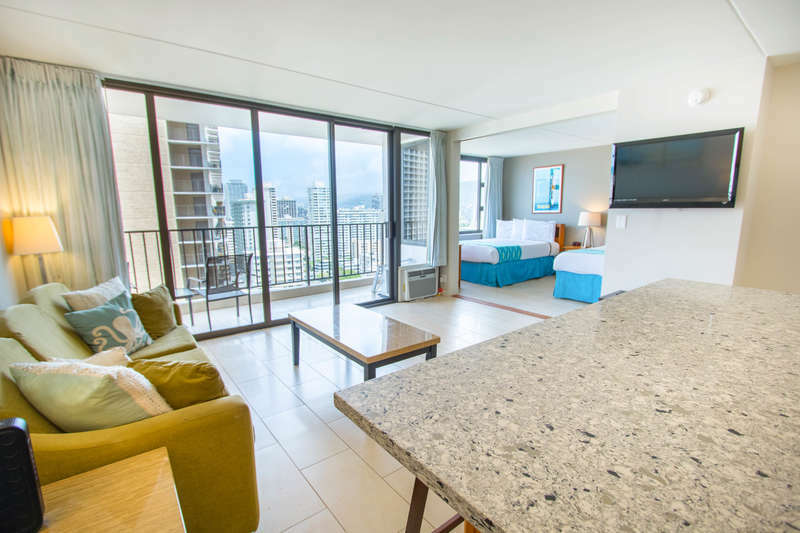 In addition, all suites in the Waikiki Banyan managed by Koko Resorts include a full size kitchen which will save you money and help you eat more healthy by not eating out for every meal. Please note the actual bedding configuration prior to booking to ensure the proper bedding for your stay. Maximum occupancy or the number indicted that a suite sleeps may not always be the same as the number of guests that a suite can sleep in a traditional bed. Portable (folding) cribs and high quality inflatable mattresses are available for rent at $10 per night upon advanced request. For your convenience, Koko Resorts provides laundry detergent under the bathroom sink and coin operated laundry machines are available on every floor. Upon 24 hours or more advance notice, in-unit towel exchanges are available at $15 per exchange and tidy clean maid service is available at $35 per service. In case of the unexpected, Koko Resorts offers 24 hour emergency guest assistance just a phone call away.